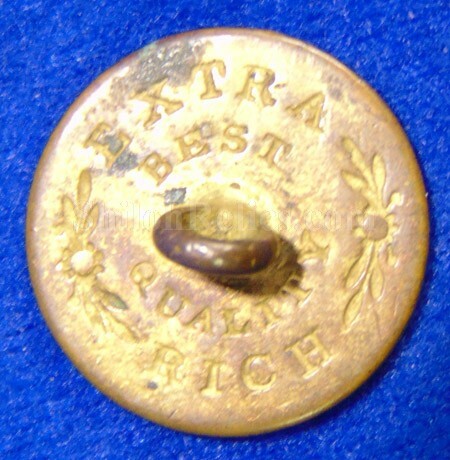 Here is a great looking early 1-piece coat size uniform button from the 1820’s. This is the version that is designed with the hunting horn hanging from a cord in the center of the button. It has 18 stars around the edge with 9 of them above and 9 of them below the horn. It has the lined background. 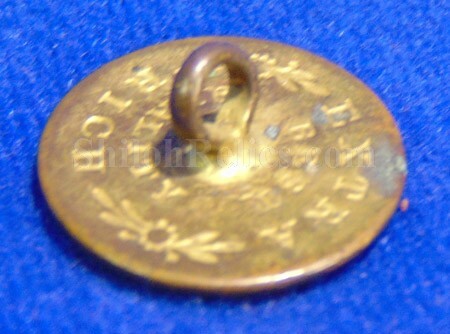 On the back of the button it has the original shank intact. It has the backmark of "EXTRA RICH BEST QUALITY" still clearly visible. This is the pattern that is illustrated as figure RF28 in Albert’s button book. As you can see it has a great tone to the brass with fine detail. There is some of the original gold gilding remaining in the recesses that looks beautiful. This is a nice looking button.